This was a difficult topic to categorise as the St. Michael’s line is or was not an actual track or boundary but if you believe in energy lines then it is a real path that runs across the northern end of the moor. Ley lines and energy paths initially seemed to me as a fanciful notion but having read several books on the subject there appears to be an awful lot of either coincidences or truths. Talk to any aficionado on ley lines and they will most likely advise you to read a book written by Alfred Watkins called ‘The Old Straight Track’ which he wrote in 1925. Whilst out riding one day Watkins reigned in his horse to look at the Herefordshire landscape where he maintains he saw a network of lines, “standing out like glowing wires all over the surface of the countryside.” These lines intersected at various nodes upon which stood churches, prehistoric ritual monuments and other sites of, “traditional sanctity.” This theory was to give birth to the idea of Leys which Watkins considered were the remains of trackways built by Neolithic people and used to guide travellers across difficult terrains. Since then this notion has be expounded upon in many ways, one of which is that the ancient trackways were in fact lines of earth energies. This idea seems to use the premise that early man could detect these lines and purposefully built their monuments along them. There are even those that believe it is possible to communicate with aliens at the intersection of some of the energy paths – ‘nother pint of cyder please? As time passed the ‘leys’ of Watkins became ley lines and followers of the theory began finding them all over the country. Dowsers began tracking the ley lines and discovered some of them described recognisable shapes, read any book on Glastonbury and you will see numerous examples. This is a very, very brief account of ley lines as the subject is so deep and diverse it alone would take up a whole website, if you would like to find out more I can recommend the books on the reading list below. The archaeological world to some degree does recognise Neolithic alignments and refers to them as ‘Cursuses’ and they are considered components of ritual landscapes. However, they are never as long as ley lines and only stretch to a few miles at best. In the late 1960’s, John Mitchell came up with the idea that if you drew a line from St. Michael’s mount in Cornwall to Hopton in Norfolk you would find numerous churches standing on it that were dedicated to St. Michael. In addition there were many prehistoric ritual features and centres such as Glastonbury and Avebury, this line was christened ‘The St. Michael Line’. In the 1980’s the line was actually followed by two men called Miller, who is a dowser and Broadhurst this expedition resulted in a book called ‘The Sun and the Serpent’ in which they describe their travels. According to them the line appropriately enters Dartmoor at Brentor and the church of St. Michael’s, it then tracks north-west to Lydford where it was intersected by a ‘black line’ at Lydford Castle. In the book they describe how the dark energies from this intersecting ley passed through the sinister Lydford Castle, causing them to feel a “physical nausea’. The energy flow then led to Brat tor and on to Yes tor after which it led on to Belstone tor which is said to be named after the sun god – Baal. From here the line veered up through the Nine Maidens stone circle, after which it turned eastwards and left Dartmoor at, according to my calculations, the old granite cross near Ringhill Copse. Now call this a coincidence or not but as you can see from the links above I had already written pages on every point on the St. Michael line (except Belstone tor) before writing this one without prior knowledge of its course??? As with most things if there is a male there needs to be a female and so it is with these ley lines. The same authors also tracked another energy line which is called the ‘Mary Line’ after St. Mary. 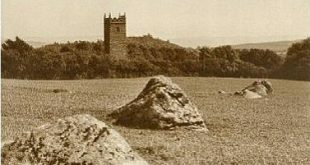 This is said to weave roughly along the same course as the St. Michael line and on Dartmoor it enters at Brentor and then flows down to Mary Tavy where the church is dedicated to St. Mary. From here it tracks north-east to Throwleigh where once again the church is dedicated to Mary. The line then veers southwards to Gidleigh and then on to the Neolithic dolmen called Spinster’s Rock which could have female associations. The Mary line travels eastward to the Iron Age hillfort at Prestonbury and leaves Dartmoor at Dunsford where once again the church is dedicated to Mary. This line is not so convincing because in the case of Throwleigh the church was not dedicated to Mary until 1846 and Gidleigh church is dedicated to St. Peter. Therefore out of the 5 villages along the route only two of them have early dedications to Mary, Spinster’s Rock is tenuous and Prestonbury Castle is totally unrelated. Graves, T. 1986 Needles of Stone, Gothic Images Pub., Glastonbury. Miller, H. & Broadhurst, P. 1989 The Sun and the Serpent, Penwith Press, Hayle. Pennick, N. 1997 Leylines, Weidenfield & Nicholson, London. Watkins, A. 1995 The Old Straight Track, Abacus, London. From many decades of research I can reveal one of the great truths about many ley lines – they obtain their energies from volcanic plugs and extinct volcanoes. The Saint Michael line is no exception – extend the line to the S.W. and you will find its power, a volcano on the Azores. Extend a line from here and you will find that it passes accurately along Pennsylvannia Avenue in the USA, part of the right-angled Federal Triangle. It goes through The White House, Bear Butte and Devil’s Tower volcanic plugs, towards the setting Sun in Mid August and on to the right-angled constellation Virgo. ALL of the capital cities in the USA are in a straight lines from extinct volcanoes of the Galapagos, Bermuda and the Azores. the UK also has its capital cities in the form of a right-angled triangle, with Edinburgh carefully placed between two volcanic plugs, and its main square, St. Andrews, with its paths lined up between FIVE volcanic plugs. There is much more in my book “Ley Lines of the UK and the USA”. After reading this theory no-one can seriously deny the existence of ley lines and the fact that they are still being used and manipulated. I recently visited st Michaels mount, where I was overwhelmed by a feeling bringing me to tears. My legs are not good and could not make it to the top, however I have wanted to visit since small and will return, as I feel I must. It is even stranger that unwittingly I have strayed in or near other sites and had same feeling. Similar effects in Caribbean, canaries and venice. Now I am intrigued, I am born under the virgo sign and feel like an old soul with an inner knowledge? I know the answer if you DRAW A straight line from Brentoor chaple to st michaels island modern day Drakes island where there used to be a chaple dedicated to st michael all on the River Tameris Tamer I wrote a theory on amazon uk called ictis closer than you think im no writer. But wanted to say i was the one that found Avalon read melkins prophecies as Drakes island is a dormant volcano and A Royal island in Devon was given by king jonas of Devon to Glastonbury Abbey in 607ad and theres a subtarainian caverns going to my island.